St. John Vianney has a special place in the heart of our family. When my firstborn was getting read for his first confession, we read The Cure of Ars: The Story of Saint John Vianney, Patron Saint of Parish Priests. It has since become our tradition to read it for each child before they make their confession. It is an engaging book even for adults and it was a big influence on my children. They were particularly impressed with how St. John withstood mocking and insults from the devil and got to the point of actually becoming unimpressed with Satan's antics. Many a dinnertime my children would tease one another by jeering, "Potato eater!" as they dug into their mashed or baked potatoes, as that was one of the insults Satan used against St. John because his diet consisted in large part of potatoes. My third son, Gabriel, actually took John Vianney as his confirmation name. When the bishop confirmed him however he only called him "John." That was a little disappointing. There are several St. Johns and each of them have a story and had special gifts; I guess I wanted to hear the differentiation. And of course since St. John is the patron saint of priests, he has a special place for my son Noah and my Godson Paul, as they continue to discern a priestly vocation. There are other lessons to be gleaned from the life of this saint - He had difficulties as a student and his superiors thought he would do the least amount of damage if they sent him to Ars, a remote town in the country of France. St. John Vianney, Priest (Patron of priests) Feast day - August 4 Universally known as the "Cure of Ars," St. John Mary Vianney was ordained a priest in 1815. Three years later he was made parish priest of Ars, a remote French hamlet, where his reputation as a confessor and director of souls made him known throughout the Christian world. His life was one of extreme mortification. The first treasure to open is God's forgiveness: from the first moment he arrived in Ars, Fr Jean-Marie had become the man consumed by the confessional. He had gone to Ars, indeed, he had become a priest to convert souls, together with Christ, to Christianize the world.His parishioners flocked to him for confession and felt the joy of God's forgiveness and of conversion. He listened, understood, read their minds, prompted repentance and comforted them.Ars became the European capital of reconciliation with God: men and women from across Europe and around the world would set out for France because they truly believed that in an out-of-the-way French village, a priest consumed by prayer and penance was speaking of God, hearing confessions and guiding souls to holiness.The pilgrimages to see him became international: 10,000, 100,000, 400,000 or perhaps even more pilgrims went every year to Ars for 30 years. They were simple people, famous founders, statesmen, Bishops. They left him, renewed.And all, like the peasant of Macon who when asked: "But who did you see at Ars? ", were able to reply: "I saw God, in a man".In the summer of 1859, Ars was still being invaded by pilgrims. On 2 August of that year, Fr Jean-Marie received Holy Communion and Extreme Unction from his own curate in simplicity and joy. He came face to face with God at dawn on 4 August 1859.On the feast of Pentecost, 31 May 1925, Pope Pius XI enrolled him among the saints, and on 23 April 1928, declared him Patron of the world's parish priests. "Contradictions bring us to the Foot of the Cross, and the Cross brings us to the Gates of Heaven . . ."
"O how great is a priest! The priest will not understand the greatness of his office until he is in Heaven . . . Go to confession to the Blessed Virgin, or to an Angel. Will they absolve you? No. Will they give you the Body and Blood of Our Lord? No. If I were to meet a priest and an Angel, I should salute the priest before I saluted the Angel. The latter is the friend of God; but the priest holds His place. St. Teresa kissed the ground where a priest had passed. When you see a priest, you should say, "There is he who made me a child of God, and opened Heaven to me by holy Baptism; he who purified me after I had sinned; who gives nourishment to my soul. " At the sight of a church tower, you may say, "What is there in that place?" "The Body of Our Lord. " "Why is He there?" "Because a priest has been there, and has said holy Mass. " The priest has the key to of the Heavenly treasures; it is he who opens the door; he is the steward of the good God, the distributor of his wealth . . . the priest is not a priest for himself, he does not give himself absolution, he does not administer the Sacraments to himself . . . he is for you. After God, the priest is everything. Leave a parish 20 years without priests; they will worship beasts. When people wish to destroy religion, they begin by attacking the priest, because when there is no longer any priest there is no sacrifice, and where there is no longer any sacrifice, there is no religion." "We must never lose sight of the fact that we are either saints or outcasts, that we must live for Heaven or for Hell; there is no middle path in this. You either belong wholly to the world or wholly to God. "If people would do for God what they do for the world, what a great number of Christians would go to Heaven." This is a re-posting of something I wrote in 2005. It still gets a lot of people looking for it. There has been much discussion, much of it heated, and misunderstanding regarding a quote by St. John Vianney to a married woman regarding child bearing. I have found the context and quote in its entirety from a reliable source. The Cure D'Ars - Trochu. The definitive life, based on the official "Process of Beatification and Canonization," and thus totally factual and documented. Of humble education and assigned to a forgotten farmers' village, he attracted the whole world to Ars and was proclaimed "Patron Saint of Parish Priests" in 1929. He ate one meal a day, slept only a few hours a night, heard confessions up to 17 hours a day, converted thousands. 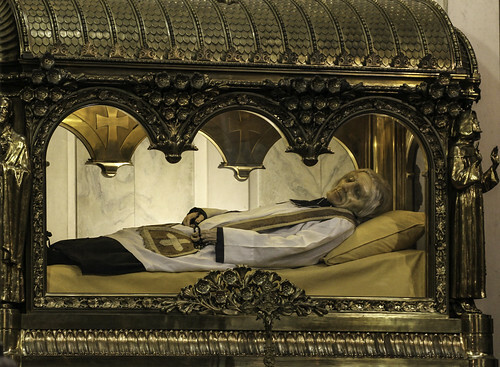 His body remains incorrupt. A grace-filled story of total love of God! Married people were shown the nobility of their calling and he exhorted them to fulfill holily its duties. A lady of the name of Ruet, of Ouroux, in the department of the Rhone, had already a large family and was about to become a mother once more. She came to Ars in order to seek courage at the feet of its holy Cure. She had not long to wait, for M. Vianney summoned her from amid the crowd. "You look very sad my child." he said, when she was on her knees in his confessional. "Oh! I am so advanced in years Father!" :He comforted , my child... if you only knew the women who will go to hell because they did not bring into the world the children they should have given to it." "Come now my little one, he said with fatherly kindliness to the woman who confided to him her anxiety because of her large family. "do not be alarmed at your burden' our Lord carries it with you. The good God does well all that he does: when he gives many children to a young mother it is that he deems her worthy to rear them. It is a mark of confidence on his part." Now note what he is not saying. Father John is not saying that infertile women through no fault of their own are going to hell. Nor is he saying that women who for grave and serious reasons who have practiced marital chastity with their spouses are going to hell. Those two mischaracterizations of what the saint said are simply wrong. He said nothing of the sort. So why would a woman who does not bring children into the world possibly be damned to hell for it? So what did St. John really say? He affirmed that hell exists. The church teaches this. He affirmed that it is possible to go there and that in fact hell is not empty. The church teaches this. The church teaches that to die in a state of mortal sin dooms one to hell. The church teaches that contraception is an intrinsically evil act and in fact could be mortally sinful. Abortion is murder and likewise could be a mortally sinful act. The church teaches and affirms that as well. What St. John said in his own way, was absolutely solid Catholic teaching and absolutely true. But I also see something else besides the teaching on birth control and abortion. Having a lot of children wears you down, literally. It takes your time, your energy, your body etc and while it does that, at least in my experience it allows the mother to be molded and more pliable in a special way to becoming holy! Yes, there are opportunities for other sins, like impatience, but in a special way we can see the simplicity of what God wants for us in the faces and lives of our children as they grow from babies to adulthood. And I think in particularly tough cases... like me!! it takes a lot of children to wear away that stubbornness, willfulness, and selfishness. The physical act of giving birth to the recovery to dealing with a teenager who has willful issues of his own, it all works together to make me a better person! I realize that all of that might be foreign to a "once saved, always saved" variety Christian, but that is what I believe St. John Vianney was saying, I think that's what he meant, and that is why I love that particular quote. Follow Elena LaVictoire's board st. John Vianney on Pinterest.